Hi I am Jan Curtis demonstrator and tutor. I live in West Wales by the sea. After working in education for over 22 years, I retired to relax and do my own thing . ( I have always been a crafter) well I visited a craft shop in Milford Haven and it has been all go since!!! I teach all paperbacks to over 20 ladies and 2 gentlemen every week. My inspiration comes from my ladies asking me can we do this or that from paint techniques to folding paper. I come up with a plan and all are happy. As requested by a lady to make a suitcase and album which has turned out ok this is my latest and favourite project. The other ladies want to make it too now!! 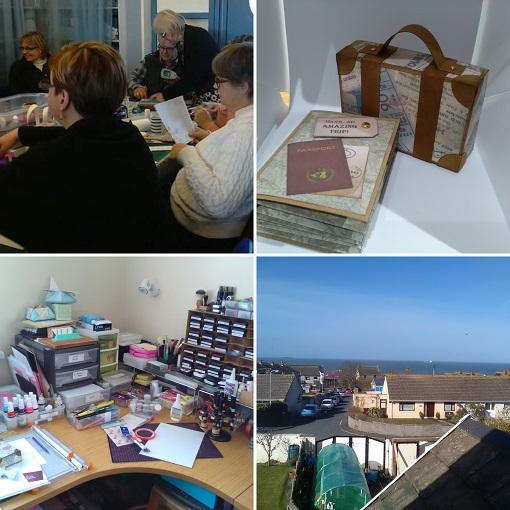 Here are some photos of my craft room view from my window working in class. Contact the Stix2 team for further information on the details below.